Claire Drennan is a fiber artist and fashion designer, committed to the fashion industry by sustainably producing in the US. 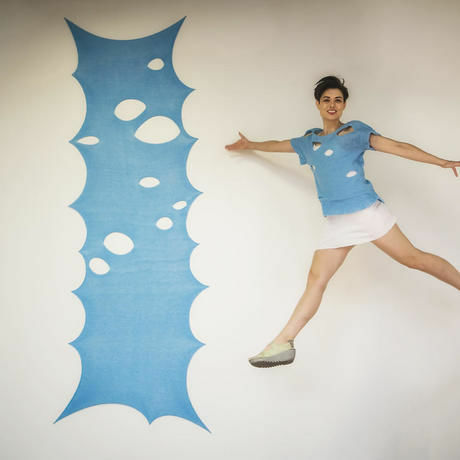 Her work is colorful, whimsical and fun, from knitted installations to wearables. Originally from East Tennessee, Claire has made her creative home in Houston’s East End since 2014. She discovered her love for fiber arts while living in Chile where she worked with artisans and designers to create custom pieces, ultimately returning to the states to. study fashion design at Boston’s Massachusetts College of Art and Design and knitting at Rhode Island School of Design. At the intersection of many of Houston’s vibrant creative communities, Claire is Studio Manager of Canal Street Studios, Communications Director of Houston’s Fashion Group International Chapter and was recently Included in Fresh Art’s Artist Inc. incubator program.